The Washington Post proves that Trump voters really are quite crazy. Remember, during the GOP primaries, Donald proclaimed that he loved the “poorly educated”. 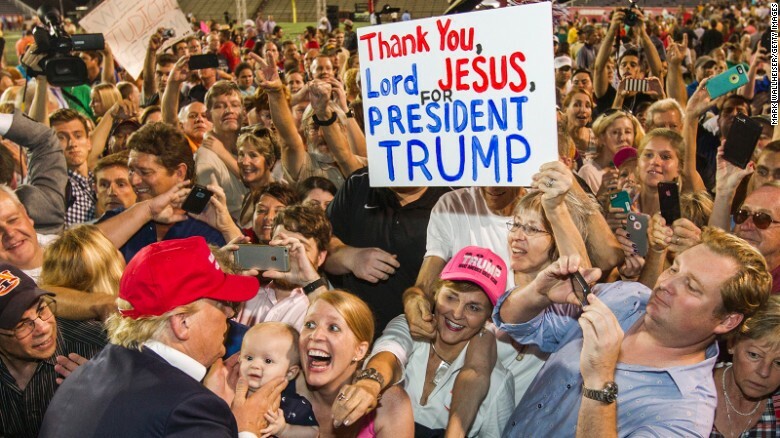 The Donald’s campaign was far more about hate and malice than whether or not the electorate was educated, but it is quite clear from the results that ignorance is not bliss. Trump supporters choose to live in a bubble, an alternate reality, a world that is white male dominant and supremacist under the guise of religious freedom. These are the same people that rail against Islamic Sharia law, while imposing their perverse brand of so-called Christianity upon America. This is nothing new after all. Christianity was used to justify slavery, then Jim Crow and now the fool who just won the White House. This entry was posted in Donald Trump, Election 2016, Evangelicals, Race, Religion, White Supremacists and tagged Donald Trump, Evangelicals, Racism, Religion, trump voters, washington post, White Supremacists on January 8, 2017 by speakingthosethings.